SAN JOSE, Calif. (VN) – Chris Horner wasn’t at the pre-race press conference for the Amgen Tour of California last Friday, but his teammates Levi Leipheimer and Ben King were. Nearly a week on from the race launch, RadioShack’s new overall leader was the only rider at the microphone atop Sierra Grade Wednesday afternoon. Horner most recently finished second overall to teammate Andreas Klöden in his title defense at the Tour of the Basque Country last month. 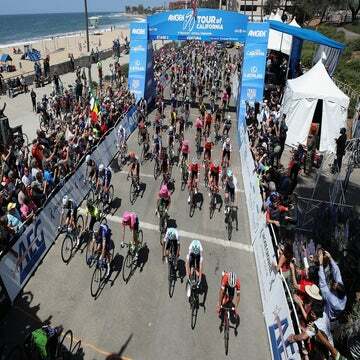 The part-time San Diego resident was the top American, in 10th overall, at last year’s Tour de France. At 39, Horner, one of the elite super domestiques for Cadel Evans and Lance Armstrong in the past, has come into his own as a team leader over the last 18 months. He said Wednesday that Giro d’Italia leader Alberto Contador was the only rider in the world capable of beating him. Horner turned professional in 1995 with NutraFig and made his first move to Europe with Francaise de Jeux two years later. Finding a poor fit with Marc Madiot’s French-speaking squad, Horner transferred to Mercury in 2000. When Mercury-Viatel fell apart after missing an invitation to the Tour de France the next year, he returned to full-time racing in the States, where he dominated through 2004. Since returning to Europe with Saunier Duval and Lotto before joining Johan Bruyneel at Astana and RadioShack, Horner has been one of the most effective supporting riders in the high mountains. Despite stage wins at the Tour de Suisse in 2005 and Tour de Romandie in 2006, Horner played a secondary role to Evans and later Contador and Armstrong. After a tough 2009 that saw him break bones on multiple occasions, Horner rode to his first-ever stage race win in Europe in the Basque tour last April. The cliché about fine wine is apropos for Horner, as his ceiling may be higher now than ever. When Armstrong’s Tour de France hopes fell away on the tarmac in the Alps last July, Horner took the opportunity to register RadioShack’s top GC result, cracking the top-10 for the first time in his career. The consummate professional, Horner said he didn’t ride on anger, but does enjoy giving his legs the last word.